Ekadashi of Bhadra Shukla Paksha is known as Padma Ekadashi.In a way, each and every Ekadashi is important in its own.Today I am going to depict the importance of Ekadashi of Bhadra Shukla Paksha which is known asPadma Ekadashi.Brahmaji narrated an incident to Naradji which reveals the importance of Padma Ekadashi.King Mandhata was born in Suryavansh.He was very religious, honest and spiritual.Because of his religiousness and honesty, he became Raj Rishi from Raja (King).His kingdom never suffered from drought.Nobody was suffering from any disease.His people were also engaged in religious activities. Due to some deeds, Raj Rishi Mandhata’s kingdom suffered from drought for 3 years.It did not rain at all.King said – When I ponder in my past, I don’t remember that I did any injustice to anybody.Whenever a king does injustice to his people, it’s natural that his kingdom has to suffer from natural calamities like – earthquake, excessive rain, flood and drought.But, I don’t think that I did any such injustice with my people because of which they will have to suffer from drought for three years…! Even then, I might have done some sin in past due to which my people are dying of starvation.I should think of some remedy for this.King along with his few people went to jungle.There in jungle they got darshan of Angira Rishi.They were very happy after getting darshan of Angira Rishi.Angira rishi asked the king about the well-being of his kingdom.King said – I am aware and understand that I did not do any injustice with my people.Even then why is my kingdom suffering from drought of rainfall?Rishi Angira said – King, you are correct…!You are so religious because of which your people are happy and wealthy.Even then if it did not rain for 3 years, there is one reason for that which I am able to understand.Right now, religion is favorable in all respects.Here, in Satyug, Brahmins are considered to be great ascetics and the best.But, in your kingdom one Kshudra (poor man) is doing austerity. He Govinda, you are also known as Budha Shravan. You destroy my sins and provide me happiness in all respects. To us, sacred people observing Ekadashi fast, you provide bhog (enjoyment) and moksha (liberation). I bow before you again and again. 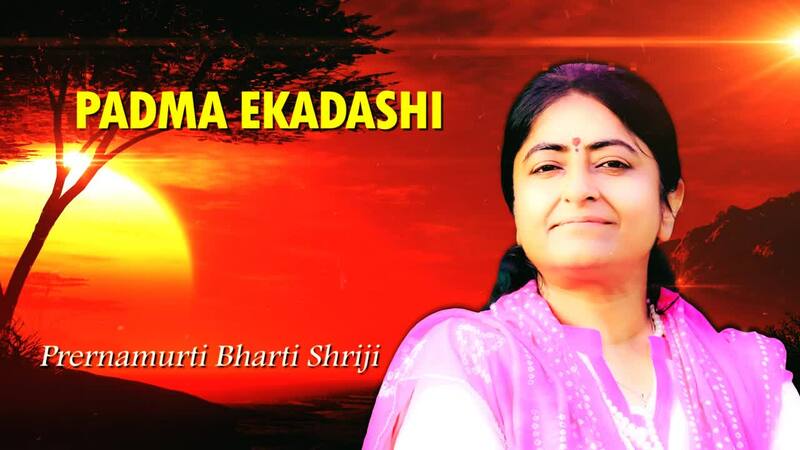 Coming ekadashi is known as Indira Ekadashi. By observing its fast, the ancestors who are living in inferior births (Nich Yoni) attain a superior state. But you take benefit of Padma Ekadashi today. Narayan Narayan Narayan Narayan Narayan Narayan hari hari. Hari Narayan Narayan Narayan Narayan Narayan Narayan hari hari.